The Honda Lock strike, involving 1,700 workers, appears to be intensifying, with employees yesterday morning rallying outside the factory before staging a short protest march, in defiance of black-clad riot police. Police left without clashing with workers. Honda nevertheless threatened workers over loud speakers that they would face “serious consequences” unless they accepted the offered 100 yuan pay rise. Many Honda Lock workers currently earn the local official minimum wage of 900 yuan a month, $US132, for a 42-hour week. They are demanding an additional 800 yuan a month, 89 percent more. The workers are not provided with dormitories, and must live in nearby apartments that typically cost $44 a month [300 yuan] for rent and utilities. Honda Lock workers have also been provoked by oppressive workplace conditions. They are forced to stand for eight hours, with pregnant women allowed to sit only in their last trimester. Workers are not allowed to speak to one another, have to obtain passes before going to toilet, and are strictly monitored by management even when getting a drink of water. The strike was triggered on Wednesday morning when a company security guard denied a female worker entry to the plant because her ID card was supposedly improperly attached to her shirt, and then forced her to the ground after she protested. These developments represent a direct challenge to the Chinese Communist Party’s ban on any independent organisation of the working class, which has been in place since Mao’s peasant armies came to power in 1949. The Financial Times yesterday reported: “At plants where the strikes are continuing, plain-clothes surveillance of workers and reporters is increasing.” The full extent of the strike wave across China remains unclear, as some have reportedly been settled or suppressed shortly after emerging, while other struggles have been deliberately ignored by the state media. In Zhuhai, Guangdong province, nearly a thousand workers in a Flextronics plant struck on Thursday, demanding a pay rise to bring them in line with the 2,000 yuan received by Foxconn workers. US-owned Flextronics is the world’s second largest outsourcing electronics manufacturer, after Foxconn, and employs 30,000 workers at its Zhuhai plant. Workers complained that they are subject to a brutal production regime similar to Foxconn, but receive just 965 yuan a month. This wage is similar to that at Foxconn before a series of suicides forced the company to offer pay rises. In Shanghai, 2,000 workers at TPO Displays, partly owned by electronics giant Foxconn, went on strike on Wednesday, protesting against rumoured company plans to relocate the plant to Nanjing. The workers produce LCD screens for mobile phones and GPS devices. In Xian, Shaanxi province, Japan’s Brother Industries’ two sewing machine plants were shut down by a strike of 900 workers that began on June 3 in demand of higher pay and better conditions. The ACFTU head of the factories claimed that workers had agreed to return to work last Thursday, after the Japanese management made concessions. 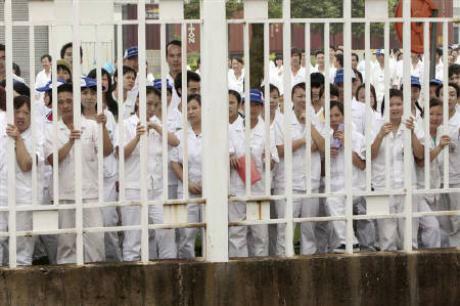 In Jiujiang, Jiangxi province, 8,000 workers protested at a Taiwanese-owned sport equipment factory. Last Saturday, a female worker not wearing her ID card was blocked from entering the plant, leading to an argument in which security guards assaulted another worker who tried to mediate. After rumours circulated that he died had from his injuries, the pent-up anger at the plant erupted on Monday and workers smashed the security department, factory gate, equipment and vehicles. The strike ended when 200 police officers arrived and arrested the security guards who had attacked the worker. The police remained to ensure that production resumed. In Hubei province’s Suizhou city, 400 workers staged an anti-privatisation protest in front of their state-owned textile factory. The plant had been sold to a private business owner who was unable to revive production, and instead plundered workers’ pensions and other benefits. The local authority bought back the enterprise, only to sell it to real estate developers. Workers began protesting the sale last month and the issue remains unresolved. The international financial press continues to watch the emerging workers’ movement in China with great unease. A comment by Tom Mitchell in Wednesday’s Financial Times warned that disruption to global supply chains caused by industrial action would likely prove just as damaging to investors as wage concessions. “The complexity of the global supply chain may be something to marvel at—but it comes at a price,” he noted. “The inherent fragility of a farflung system with millions of interactions can lead quickly to negative widespread repercussions for the companies whose futures are bound up with it. The CCP is well aware of the dangers posed by the growing strike wave. Currently it is treading a fine line, hesitating to unleash repressive measures against the striking factory workers for fear of triggering a broader oppositional movement, while at the same time preparing for violent confrontation to suppress the working class, as it has done in the past.